I reviewed SHADOW HILLS a couple of months ago here on the blog (read my review), and really enjoyed it, so I was happy to be asked to be part of the official SHADOW HILLS blog tour. 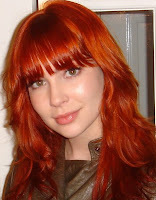 And I am pleased to welcome Anastasia to Presenting Lenore today. SHADOW HILLS is set in a boarding school. If you could be a teen again and go to any boarding school in the world, where would you go and why? While I was researching SHADOW HILLS, many of the boarding schools sounded so intriguing that I really found myself wishing that I could go back to boarding school. Though several of them were very appealing, I think the one that I would choose to go to would be Deerfield Academy in Deerfield, Massachusetts. It's on the edge of the Berkshires in western Massachusetts, which is a beautiful area. I've been to their campus, and it's very attractive, and their curriculum is really awesome. Which of your supporting characters in SHADOW HILLS needs their own novella? I'd really like to write something about Brody and Adriana. I just love them as a couple, and I can't show anything that happens between just the two of them because the novel is written in the first person from Phe's point of view. And the other thing that I would love to do as a novella is a historical where I could get more into the origins of Shadow Hills. I love them too! Cool idea. Both you and I love Nina Malkin’s novel SWOON. Who would win in a fist fight between Sin and Zach? Oh, wow---I'm not sure. Zach is probably bigger and stronger, but I think Sin has more of that competitive, kind of mean streak, which would give him an advantage. Still, when Zach gets really angry, especially when he's protecting Phe, he has some truly awesome power. So in that situation, I think Zach might very well win. Let’s say Zeus called you up and told you that you could change the ending to any Greek myth. Which one would you change? I would change the myth about Orpheus, who goes into the Underworld to get back his love Eurydice, who died on the day they were married. He plays such beautiful music that he is let into the Underworld and charms everyone there, even Pluto, the King of the Underworld. So Pluto lets Orpheus lead out his wife, playing his music, but he can't look back or he loses her. Just as he's emerging into the sun, Orpheus forgets and looks back to make sure she's okay, and so she's unable to come out, and he isn't let back in. I think that's so sad! So I would definitely change that ending and let Orpheus and Eurydice both get out of the Underworld safely. Which 2011 debut author books are you most looking forward to reading? There are a lot of interesting books coming out in 2011, but I think Clarity by Kim Harrington is the one I'm most looking forward to. It sounds like an interesting mystery as well as a paranormal. Check out Anastasia's website to find out more about her book and to find the complete blog tour schedule. Great interview! I interviewed her a couple of weeks ago. She's very interesting. I'm looking forward to her next book! Also, I wanted to congratulate you on winning BBAW's best YA fiction blog! Well done and well deserved! Fun interview! I used to dream of going to boarding school in Switzerland. I'm sure it would never have lived up to my dream! What a great interview! Anastasia seems really down to earth and just an all-around nice person. I read Shadow Hills not too long ago and luuuuurved it. I can't wait for a sequel! Not to mention Anastasia is probably the most beautiful author I've ever seen. Gah, I feel like I really missed the Swoon boat by listening to it on audio! I would definitely agree, though that Sin would likely win out given his thirst for revenge. 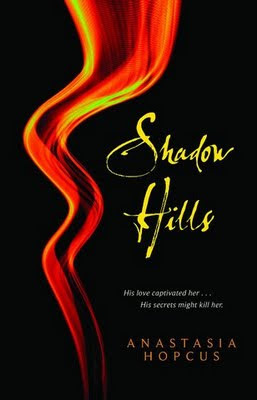 I would definitely read novellas centered around Shadow Hills, particularly the historical.